Why Are the Leaves Falling Off My Ficus Tree? In the wild, ficus can grow up to 60 feet tall, according to the United States Forest Service. However, this tropical tree is commonly used as a houseplant, where it seldom exceeds 8 feet tall. Leaf drop is a common complaint with this plant. There are several factors that may cause this phenomenon. Determining why your ficus is dropping its leaves is the first step to keeping your houseplant healthy. The ficus grows best in moist, well drained soil. Yellowing leaves that fall from the plant are an indication you are not providing your ficus with enough water. Green leaves falling from the ficus indicate your plant has been over-watered. The Green and Ever Growing website recommends watering this houseplant when the top 2 inches of soil is dry and until water comes out of the bottom of the plant. Do not water again until the top 2 inches of soil is dry. If there is water in the drip pan for more than a day, empty it; the soil is too moist. A change in temperature, due to air conditioning or heating, or even a change of season, may stress your ficus enough that it will lose healthy green leaves. This should only persist for a few weeks, as the plant acclimates to the temperature change. New leaves should continue to grow and mature. The ficus does not react well to drafts. This includes drafts from an open door, but also air from fans and air conditioning vents. Drafts will cause healthy green leaves and new emerging leaves to drop from your ficus tree. If possible, remove the source of the draft before moving the tree, because changing your tree’s location will also result in leaf drop. 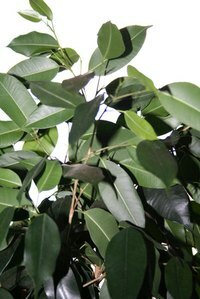 The ficus tree needs bright indirect light, such as from a south or west window. If your ficus is not getting enough light, the leaves may drop. According to the University of Nebraska, when a ficus is not getting enough light, green and even immature leaves will drop from the tree. Be careful about giving your ficus too much light as well; this will burn the leaves. When you move your ficus from one location to another, it will respond by dropping a good percentage of its leaves. According to the University of Nebraska, this is a normal reaction and the tree should recover once it acclimates. This occurs often right after you purchase the plant and move it into your home. Simply clean up the fallen leaves and water regularly; your plant should recover in a few weeks. It Is December: Why Is My Croton Losing Leaves? Why Are My Cucumber Leaves Turning Dry & Brown?